We’ve blogged before about applying gaming technology to science, but much of that has been about using games or gaming system chips. A recent Wired magazine article reveals another interesting use case: taking the capabilities of something like Microsoft’s Xbox360 Kinect system and applying it directly to science research! Apparently, a number of groups have decided to try out the Kinect as a “poor man’s” LIDAR (a tool that can be used to see and measure where things are in three dimensions)/complicated 3D camera setups which are expensive and require sophisticated calibration/post-processing analysis. Of course, the Kinect is not a panacea: it has much more limited range, requires researchers to build their own analytical software, and the Kinect can’t do high-speed video (yet). But, because of its much lower price, its size, and the availability of drivers because of the active Kinect hacking/DIY community (and the support that even Microsoft is providing for people using Kinect beyond gaming), a number of researchers have decided to embrace the Kinect as a scientific tool. 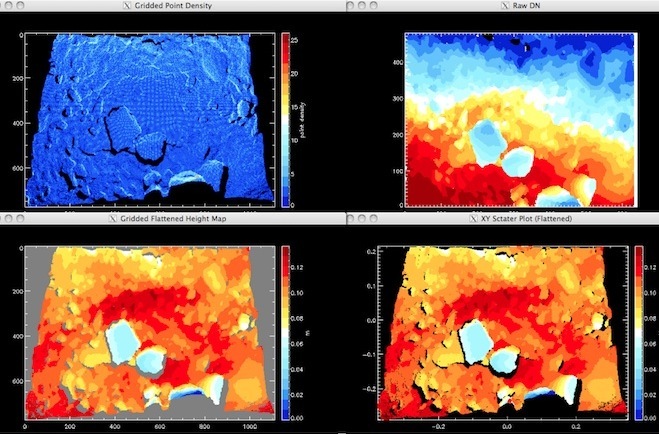 The article profiles two potential use cases which only begin to scratch the surface of what this technology could be capable of: mapping meltwater lakes that form on top of glaciers (see images below) and studying small body impacts in space. The Kinect’s best asset may be that it inspires students, Tedesco said. Rather than a daunting black box with convoluted cables and arcane software, the Kinect is something that many students are already familiar with. “I’m actually on my way to buy two of them right now,” he added.